ROTTERDAM, April 11, 2019 - SJR Tank Construction and HES Botlek Tank Terminal, a subsidiary of HES International B.V., are proud to announce a new partnership. HES Botlek Tank Terminal (HBTT) has contracted SJR Tank Construction to construct six high-quality tanks for biofuel storage. Following their successful partnership in 2017, in which seven fully-assembled tanks with a joint capacity of no fewer than 70,000 m3 were delivered, both HBTT and SJR Tank Construction are delighted to start a new partnership. The storage tanks each have a capacity of 3,400 m3, a diameter of 12 metres and are 30 metres in height. The first four tanks are currently being constructed in the conditioned production hall at the RDM site in Rotterdam and will be followed quickly by the final two tanks. The completely finished tanks will then be transported by water and installed in the foundations at HBTT in Botlek. The construction of these six tanks forms part of a considerable investment in HBTT’s tank storage. The capacity was doubled to 490,000 m3 in 2017. The delivery of these six tanks increases the total storage capacity to 510,000 m3. As well as the partnership with SJR Tank Construction, civil engineering works were also contracted to De Vries en Verburg Bouw and are already in full flow. 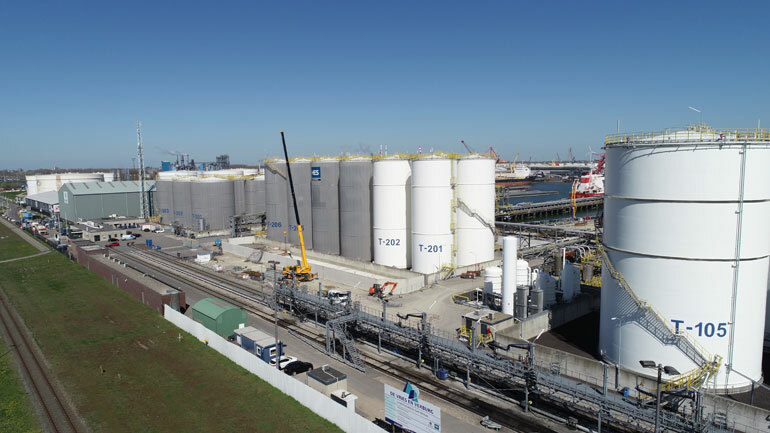 HBTT is one of the most modern and certified tank terminals in the world and is the first terminal in the Netherlands to hold the ISO 28001 certificate. More information about SJR Group can be found at www.sjr.nl and https://www.linkedin.com/company/5214631.